Stainless steel blades can be successfully heat treated/annealed in air with Minimox coating. Some tool steels also work well, including high chromium alloys like D2. In addition, good edge retention is retained. 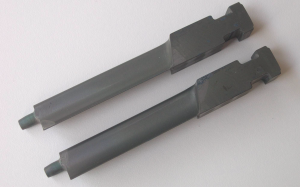 Unfortunately, carbon steel blades will not be successful, nor will lower chromium tool steels like M2. Martensitic stainless steels can exhibit catastrophic oxidation if heat treated in air. Using Minimox as a pretreatment for 400 series stainless steels can allow heat treatment in air, replacing the more expensive vacuum heat treating process. Turbine blades after Minimox pretreatment. Note that only a light residue is visually present. See our Technical Bulletin for full details on heat treat furnace protection. Increase the life of thermocouple covers with the simple dip Minimox process applied at your shop. As shown below, the treated portion has a thin, stable oxide while the untreated surface continues to spall and flake, leading to the part replacement. This is a 304 stainless cover heated to 815°C for 200 hours in air. The ease of application for Minimox means that it is almost effortless to protect your furnace components by simple spraying. The surface of the Minimox-coated belt was smooth and the base metal protected. The untreated belt section was flaking, exposing fresh metal on a continual basis. This can increase carbon uptake into the belt material, causing premature belt replacement. Because Minimox is a new product, we are not yet able to guarantee the efficacy of Minimox for improving furnace component lifetime, but trials are in progress. Contact our office for more details.